Today's offering is not a cake but a pudding...I thought I'd branch out a little! :-) This is a lovely light pudding that would be perfect after a big meal, the lemon also gives it a bit of zing so it's quite refreshing too. The surprise element of this dish is the lemon curd layer underneath the unassuming sponge exterior. It's one of those puddings where you mix up all the ingredients together and then when you bake it, it seperates out into two layers - one of sponge and one of lemon curd. You may have tried a lemon surprise pudding before but the blueberries here add an extra tasty element. The reason this pudding is so light is the method. Egg yolks, lemon zest and juice, butter, sugar and a little flour are mixed together and then egg whites are whipped up and folded into the lemony mixture. Whipping the egg whites ﻿puts lots of air into the pudding which means it's not too heavy. 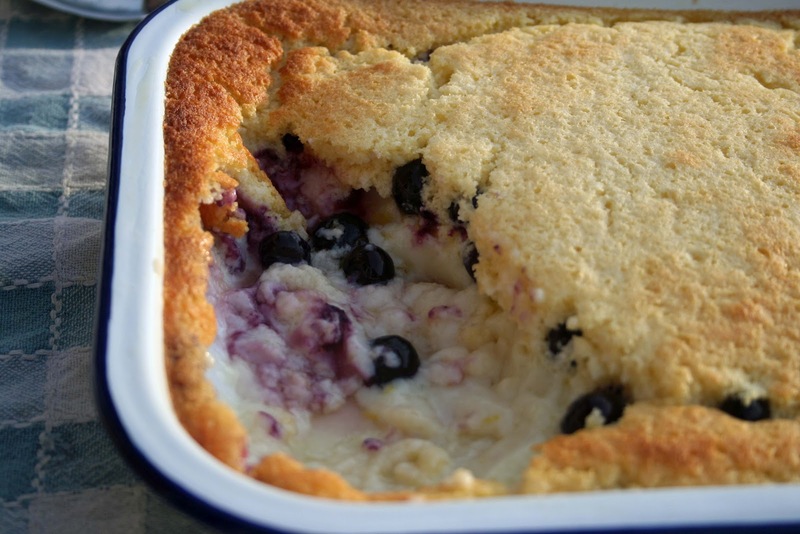 This pudding is really summery but would also be great at this time of year after a roast or when you want something warm on a cold day. This is certainly one that could be made on a regular basis as it's so quick and easy too! Pre-heat the oven to 180c/160c fan/gas 4 and prepare a 2 litre ovenproof dish by lighting greasing it with butter. Put the softened butter and golden caster sugar in a bowl and beat with an electric mixer until it's really pale and fluffy, this could take a good 5 minutes. Next add the lemon juice and zest to this mixture, along with 4 egg yolks. The yolks should be added one at a time until well mixed. There is a good chance that it will look curdled at this stage! 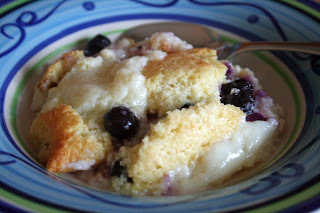 Next sift over the flour and stir before adding the blueberries and milk, again give it a good mix. In a seperate bowl whisk the egg whites until they form soft peaks, don't overbeat them. Using a large metal spoon gradually fold these whisked egg whites into the lemony mix. Be gentle and ensure you fold until they are just combined. 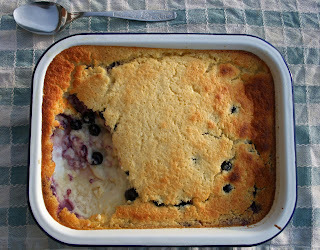 Finally, pour the pudding mixture into the prepared dish and place it on a baking sheet. It should take about 40-45 minutes to cook and will be risen and golden when done. This pudding serves 6 and can be eaten immediately but it also tastes good the next day!